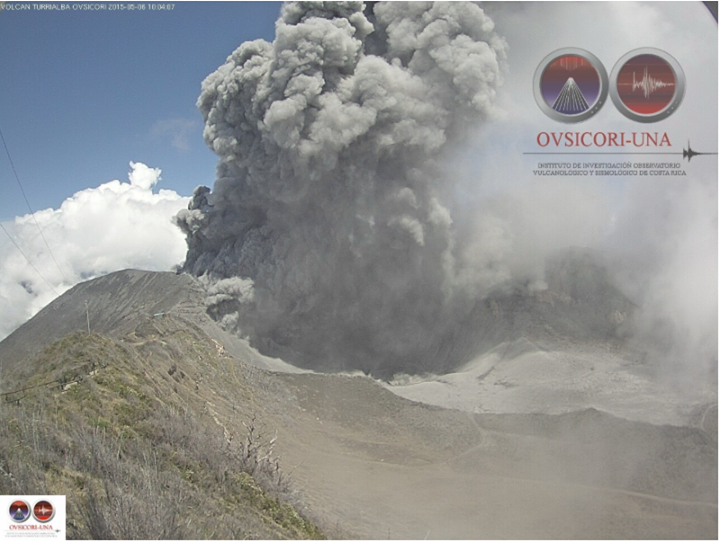 QCOSTARICA – The Observatorio Vulcanológico y Sismológico de Costa Rica (Ovsicori) reported a new eruption at the Turrialba volcano, this morning at 10:04 am. According to the Oviscori Facebook page, the eruption was “quite considerable” and the ash cloud could travel some 15 to 20 kilometres from the crater, being taken by the winds in a northeast direction towards Guápiles and could reach Siquirres. It all depends on the wind direction which is very irregular at this time and it is possible that particles also be blown towards the Central Valley, according to volcanologist Eliecer Duarte. The expert noted that the winds at different heights are ‘capricious’ and may vary. For now, the wind is blowing away from the direction of the San Jose international airport, located some 60 kilometres west of the colossus and no indication that airport operations will be affected, as it has been on several occasions since March 12. On Monday last the San Jose airport was closed for 10 hours while crews cleaned ash from the runway.